Bob Woods & Marty Peters have shared the same passion for their profession as Financial Consultants. They have held themselves to a fiduciary standard as advisors & have focused on putting their client's interests first. They believe in looking at the clients full financial picture vs chasing market returns. Their clientele consists of hard-working successful individuals & families who are disciplined and responsible in their savings. Marty started his Financial Services Career in the early 70's & has extensive back ground in the insurance industry. He has been a member of the Million Dollar Round Table each year since 1973, a premier association of the insurance and financial service industry which is limited to the top 2% of producers. Marty joined Financial Plan Design in 1986 & has specialized in implementing strategies to create and diversify client wealth using trusts, limited partnerships, insurance & asset allocation. He is an active member in Rotary: holding multiple positions including President, District Governor & has received the Distinguished Service Award from Rotary International, which is only given to approximately 50 Rotarians worldwide annually. His 37 years of commitment to Rotary exemplifies our firm's commitment to service. Bob joined Financial Plan Design in 1997 & has worked extensively towards expanding the Financial Planning Services that the firm offers. His focus on comprehensive planning has been instrumental to the growth of Financial Plan Design & the company has grown seven fold in assets since Bob took over in 2001. Bob's focus has been on engaging the client in the full picture & creating a financial plan through which the client has a clear understanding on what needs to be accomplished to pursue their goals. Bob has been a leader in evaluating different Financial Planning tools & instrumental in educating the clientele on Long Term Care Options, Retirement Income Needs, Asset Allocation & Social Security Strategies. Put the client first by providing objective financial advice. Offer clients an exceptional level of comprehensive financial planning. Provide the client with superior asset/investment management options. Bob & Marty recognized early on that someone with the same core values, education & experience would need to be brought in to continue the firm's commitment to clients. 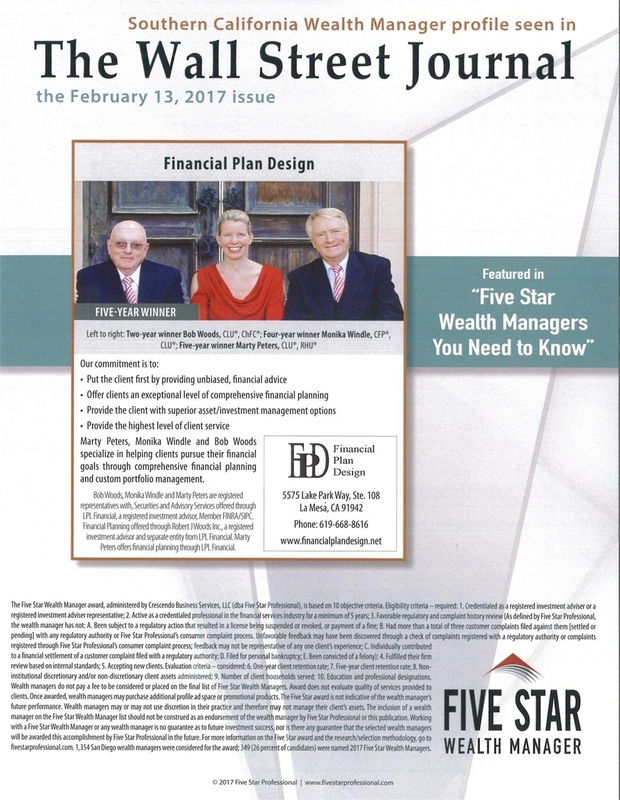 In 2008 Monika Windle joined Financial Plan Design & has been a natural fit as she shares the firms "client first" Investment Philosophy. She originally attended college to fulfill her desire to become a securities analyst & holds degrees in Economics & Finance. During her graduate work she started an internship at Merrill Lynch & realized that her passion for research would be better suited for working with individual clients vs analyzing individual securities. She brings 18 years of experience as a Financial Consultant, previously working at Merrill Lynch & Washington Mutual. She possesses a strong background in financial planning & has been a Certified Financial Planner since 2007. Her education as a CERTIFIED FINANCIAL PLANNER ™ professional along with her commitment to looking at the clients full picture vs that of their independent assets, has made her a natural fit in guiding the firm's future.